We subject our precious electronics to a lot of torture, and most of them come out worse for it. 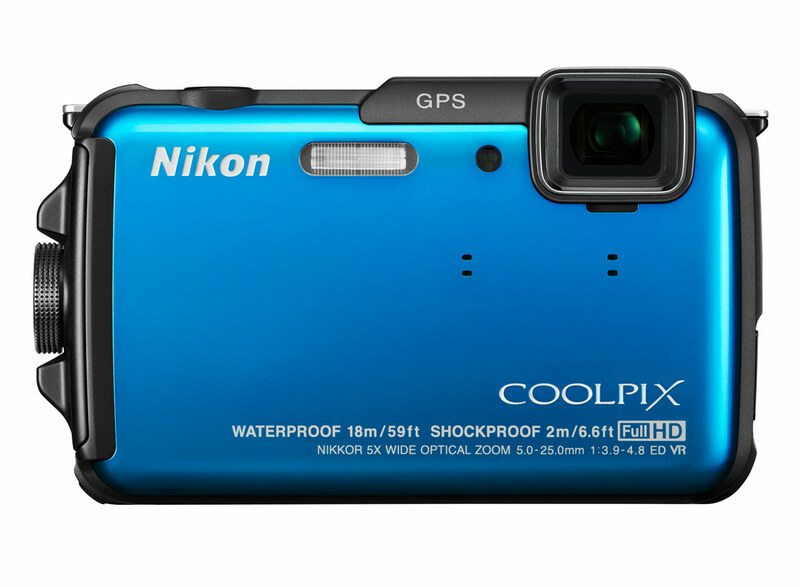 The Nikon Coolpix AW110 looks to reverse that trend by wrapping some impressive tech in a nature-resistant case. While it doesn't offer groundbreaking new features, it combines some of the best technologies from other waterproof cameras in a single, easy to use package. Nikon's got a solid camera on their hands with the AW110. While it won't break any records, it's got enough packed in its rugged frame to appease the average adventurer. GPS, Wi-Fi, stereo sound, 1080p video, and an accident-resistant case make this camera one of our recommended choices. Don't let the plastic panelling fool you: the Coolpix AW110 was built to last. The camera features a traditional corner lens with flash, a surprisingly sharp 3" LCD on the back with buttons for navigation and zoom, and power and shutter buttons along the top. Facing the back of the camera, the right side protects the USB port and SD card slot behind a locking door, while the left side has the Action button which lets you quickly change shooting modes. The camera weighs in 6.9 ounces: not the smallest we've seen, but certainly not the heaviest. The camera sizes in at 4.4 x 2.6 x 1 inch, though that measurement doesn't include the rather sizeable protruding door lock. Despite this, the camera is comparably sized to others in its class. It's relatively comfortable to hold as long as you can avoid placing any fingers over the lens, and the controls are simplified if a little cluttered. The AW110 supports 1080p video at 30fps, maxing out at 60fps for WVGA (640x480) video for slow motion shots. The camera takes 16MP images that are sharp and clear at the center, but somewhat blurred and muddied around the edges. Exposure is handled extremely well, with low-light and underwater images appearing far less noisy and grainy than other similar cameras. Other features include a 5x optical zoom with 4x digital zoom, preset scene modes, an aperture of f/3.9-4.8, optical image stabilization, and even motion blur reduction. The AW110 can take up to 6 burst photos at 8 fps. The AW110 takes 250 photos on a single charge. While the battery is removable, you'll need to set aside about 2 and a half hours to get a full charge. While it's a little slow compared to other cameras, it still holds up well on its own. It takes about 2.4 seconds to boot, but it has a blazingly fast shutter speed of 1/20th of a second. The built-in Wi-Fi lets you remotely control the AW110 from your smartphone or tablet, a feature often seen in action cameras. Through Nikon's app, you can instantly share and upload pictures and videos to social media and image hosting websites. The AW110's GPS will tag your image with location data, provide an electronic compass, display nearby points of interest, and map out your route. Interestingly enough, the AW110 records stereo sound, which is a big plus for photographers who are tired of poor sound quality in their waterproof cameras. Nikon provides a handful of accessories for the AW110 including floating straps, cases, and even a UV lens filter. Despite its relatively few shortcomings, the AW110 is a great outdoor camera at a reasonable price. If you can look past the awkward shape, somewhat difficult controls, and slightly washed out LCD, you're left with a solid camera that has all the features you need to start shooting great photos. For users who need a bit more control or battery life, this may not be the camera for you.